Thannithorai Market has been a key market for Mylaporeans. Situated on the banks of Buckingham Canal, off Luz Corner, the market sold produce brought from the land as well as by boats plying in the Canal which originates in south Andhra Pradesh and ends in the Marakkanam Lake. Hence the name ‘thanni thorai’. The market continues to exist today and fairly busy. The boats do not ply anymore for the canal is polluted. The city’s metro rail runs alongside the canal and this market. 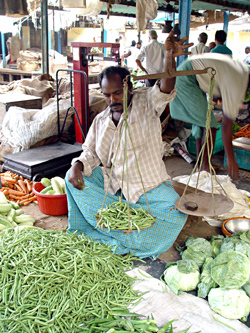 G. Kuppuswamy is a vegetable vendor at Thannithorai Market. This is his story of the market. G. Kuppuswamy Naicker’s family has been vegetable vendors for the past two generations. The market in its early days used to receive vegetables from outside Madras. Vegetables would arrive by boat along the Buckingham Canal every day. Baskets loads of vegetables would be delivered. . . The market place belonged to a Madras High Court judge Mr. Bhashyam Iyengar. He had a residence adjacent to the market where his sister (widowed) was living. Mr. Iyengar had provided that the proceeds from the market should go to his sister for her maintenance. After him, his son took over but he was not very keen on maintaining and renting the place for the market. So he decided to sell the place. The vendors of the market had established good business there and were not eager to relocate to any other place. They decided to purchase the place jointly from Iyengar . . . The 10 to 15 vendors who jointly bought the place are the current owners of the market. There are about 25 more vendors who pay rent to these people. It was built by Mr. Iyengar himself as a vegetable market. The structures for the vendors to sit, the rooms, toilets, etc were all built by Mr. Iyengar. No change has been done after that. The ‘thorai’ however is no more in use. Business is dull. The market used to be unique in those days. All the well known people would come here for vegetables. 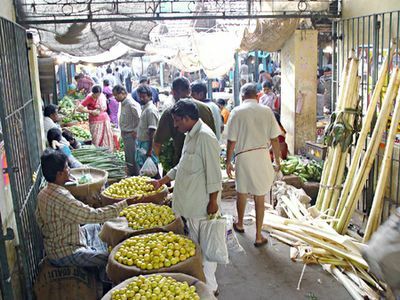 Now there are vegetables shops in every street, every nook and corner. Things were very different then. We would not even weigh accurately. We would give them liberally in basketfuls . . . But we carry on because we do not know any other business. My sons have studied. In the old days, business was very good. So they got inducted into this business quite early in life. I have two sons - one studied in Vivekananda College and another studied a course in air-conditioning repair. But then they preferred to get into business – they run provision stores. We are now old. We have given all decision taking rights to two persons among the 10-15 who jointly bought the market. At that time it seemed prudent to do so. It is quite a complicated situation. We cannot convert it to any other improved vegetable market so easily. Yes, it is a very painful decision to even think of selling this market. We were all born and brought up in this market. My mother would leave us on these very thinnai's while she was busy selling vegetables.We have literally grown up here. So we are planning to sell and make some settlement for other vendors here . . .
My sons too do not like this business. They think vegetable vending is no more a dignified business. When did the market start? Can't say. Before Independence perhaps . . . We hoisted the flag on Independence Day. Iyengar started the market in 1901. My father came in to Madras in the Tamil New Year. (could be 1916). The market was there at that time. There were four or five vendors. He also set up business there within a few years . . . The thorai supply via boats stopped after the local bus service developed. Usually 40 to 50 kilos of vegetables would came by a boat. They were all freshly cut. The canal was clean and full of water . . . Vegetables were grown organically without using chemicals . . . Earlier Luz used to be a very quiet place. There were no lights in the market. We used to have oil lamps at Luz Corner! We went to Shanmugananda Higher Sec. School now at Natesa Mudaliar Road. Then it was in Valleswarar Koil Street . . .
Mylapore had all communities living in harmony. Naikers, Mudaliars were in and around Mundakakanni Amman Koil Street. Around Mada Veedi and Nadu Theru there were mostly Brahmins. Teynampet was the popular place for the migrants from outside villages who came looking for jobs - they were mostly Rakkiars. Slowly they settled and bought the local land. They were quite bold and enterprising. It is the Brahmin community who were not interested in buying land, houses . . .. Somehow our business has revolved around the Brahmin community. They have patronized us throughout. We have also learnt to behave well and be cultured from our Brahmin customers. We have been very much influenced by them. They have been our guides. The current generation is of course different . . .
Did the boats carry only vegetables or did they carry people also? No. People would go by the Adyar River and the Adyar Boat Club area was the terminus for those boats. Only goods would be ferried on Coovum boats. Beyond Adyar, were plenty of nagamaram and panamaram thoppu (orchards). We would go there by boats, have a wonderful time eating fruits and playing around. Two annas was the fare. Nageswara Rao Park . . . Alwarpet area . . . TTK Road . . . these were all jungle areas. Most of Alwarpet was Kasturi Iyengar’s property - about 1000 grounds! Later, the government took some land(from this family) for laying roads. Eldam's Road corner always had (actor) Kamalhassan's family house. The area around the market has changed a lot… Only ten percent continue to live here . .
someone needs to go talk to Alwar and do a feature on him. He has been around long enough. History of namma mylapore is interesting but what do we do about thanni thorai getting sold out , coovamriver stinking and vidya mandir causing traffic jam. Nice report. Its really sad that that the market is going to replaced by some 'greedy' real estate developers. Since the market is over 60 years, I feel that Government should take initiatives to declare it a 'heritage site' and take steps to restore it. It will be very sad on our part that we wont leave these to the next generation.